Ministry of Communication and Information Technology published Vacancy Announcement for Chairperson of Nepal Telecommunications Authority on 2075/05/02 at Gorakhapatra. The minimum requirement for this post can check on the notice below. 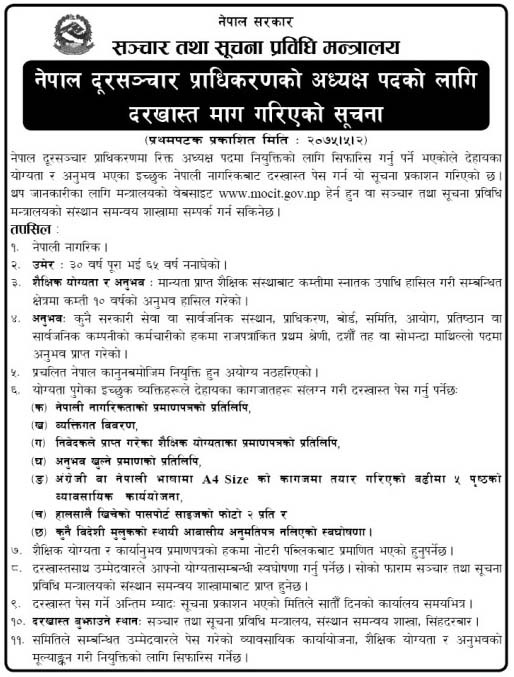 For more information about this Vacancy Announcement for Chairperson of Nepal Telecommunications Authority, please check the official site of Ministry of Communication and Information Technology Check details below. Lok Sewa Aayog Form to Fill Up Before Interview.